When the Tulipfest schedule first came out, my husband sent me a link to Lego garden activity with the single sentence: "we should go to this." With two Lego maniacs in the house, this kind of activity is a no-brainer for us, as I am sure it is for a lot of families in the NCR area. Lego events of any kind tend to draw crowds. This event appeared to be no exception. We chose Mother's Day as the day to head over. The tent was set up at Major's Hill Park, in the FUNtasia zone. The description in the guide billed it as free with the park passport, or by donation. When we got there at 2 p.m., there was nobody checking passes and no donation boxes in sight. But there were piles and piles of Lego. And lots of kids. 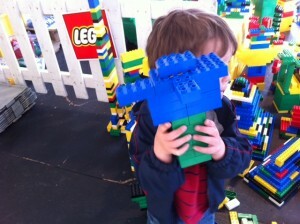 A note here: all the building blocks provided were Duplo, which is the larger Lego. It’s not what we normally play with at home, but it didn’t seem to bother my kids, or even some of the older kids who were in attendance. Creativity was everywhere. Robin Sather, A Lego-certified Professional hired specifically for the event, kicked things off that weekend by constructing large, elaborate tulips. He was still present on Sunday, but all the creations were coming from the visitors. The theme was to build something you find in your garden. Each group was given about 20-25 minutes to build a creation before volunteers asked us to clear out and make room for a new group of kids. This was not strictly policed, but it did help keep the crowds from getting too large, and allowed kids to have lots of pieces and room to let their imaginations go. We stayed for about 45 minutes, and in that time my little guy created two flowers, a bird and a nest. When I asked him later if he had fun, he said yes. The event runs until May 23 from 10:00am – 5:00pm , except for Monday May 16, when it is closed. If your kids like building with Duplo, it’s worth checking it out! Avra Gibbs Lamey (@gibbslamey) is the mother of two little Lego-maniacs. When she’s not picking pieces out of the carpet at home, she has a day job as the Communications and Media Relations Officer for the Canadian War Museum.